As I have learned from experience, laws are only as good or as bad as the people who make them. Laws that protect and serve are made by people who care about not only their constituency but also the people they may not know. Those who make laws that target people nine times out of ten have a bigoted personality. 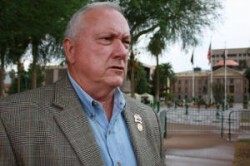 This seems to be the case of former Arizona State Senator Russell Pearce. He was one of the few legislators in just about any state who was removed from office by his own constituents. Now the American Civil Liberties Union (ACLU) has obtained from the Freedom of Information Act e-mails that had been sent to and from the former state senator. To put it mildly they are disturbing. It is increasingly clear that Pearce made no distinction between the undocumented and Latinos in general. One of the e-mails was especially revealing. I reprint it here: “We can maintain our social fabric as a nation with Spanish fighting English fighting for dominance…it’s like importing leper colonies in the hope we don’t catch leprosy. It’s like importing thousands of Islamic jihadists and hope they adapt to the American Dream. Tough, nasty illegals and their advocates grow in such numbers that law and order will not subdue them. They run us out of our cities and states. They conquer our language and our schools. They render havoc and chaos in our schools. We are much like the Titanic as we inbreed with millions of Mexico’s poor, the world’s poor and we watch our country sink.” We do not know if this e-mail came from Pearce’s office or if it was sent to Pearce’s office. What is clear however is that Pearce seems to have been dealing with people of such racist and bigoted mentality that he certainly never publicly objected to these kinds of e-mails nor say privately in any e-mails attributed to him that he objected to this mentality. We can only conclude that Pearce is extremely racist, that he hates and despises Latinos and people of non-European origin, and he honestly believed when he was state senator that he was working to “save” Arizona from the “immigrant hordes.” The ACLU is trying to use these e-mails to show that the current state immigration law was motivated by racism and bigotry and that as such should be repealed. That in my book will still be an uphill battle. Even though these e-mails reveal a very, very bigoted former official’s personality and why he helped craft Arizona’s state immigration law, there are still too many in the Arizona state government who will not let this law be repealed. The governor of Arizona, Jan Brewer, has made it clear she will let this law be repealed over her dead body. I am well aware that part of the law has been ruled constitutional by the U.S. Supreme Court, but even bad laws—or rather parts of it—may be ruled legal by the U.S. Supreme Court even though they are morally and ethically questionable. And after the revelations of a bigot who helped craft this law, this law is becoming ever more morally questionable.